of flowers and hanging baskets in an acre of garden. 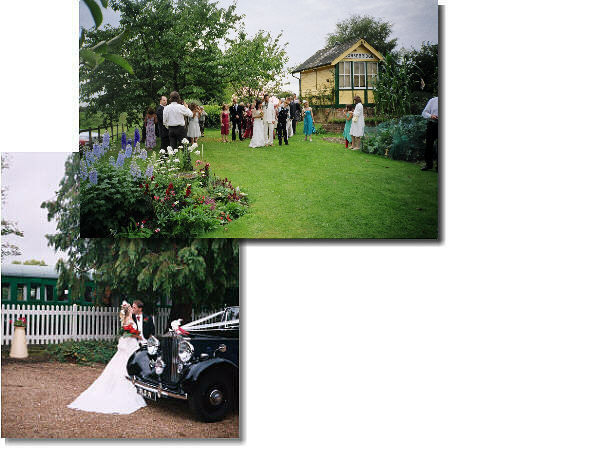 The Bride and Groom, together with their guests, can enjoy reception drinks on Platform 1, after which they can wander round the grounds at their leisure, chatting to friends and admiring the views over the water meadows and River Test. 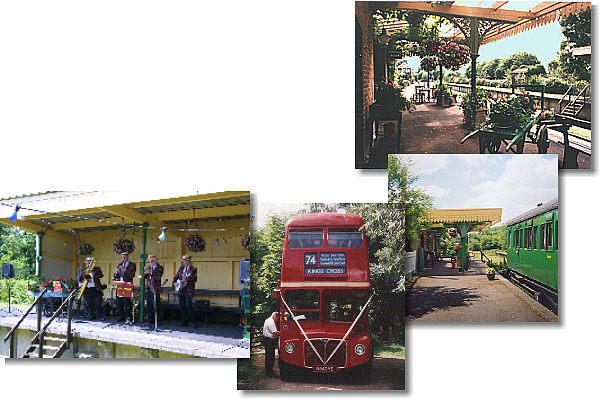 They may also delight in listening to a band playing on Platform 2 before moving down the platform and into the marquee situated at the end of the grassed track area, where there is ample room for up to 130 guests, or more, with an added extension. Here they may wine and dine in complete comfort with views through the Georgian windows to the surrounding hillsides. Click here for a picture of the marquee layout. As the station is completely away from the road there is neither sight nor sound of passing traffic. As dusk falls and all the twinkling lights appear, the station takes on a magical quality and guests may enjoy a quiet drink on the platform, or dance away the evening to the strains of a live band or disco. Our recommended caterers offer a wide variety of menus to suit all tastes, with a high standard of food and service, at varying prices to suit all budgets. There is ample parking in an acre of paddock, and as it was originally a railway siding, is solid as a rock, so no fear of getting bogged down in inclement weather, Heaven forbid! 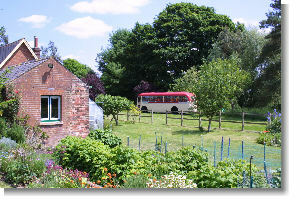 Or you may prefer your guests to arrive and depart by vintage bus. with the signal box in the background. 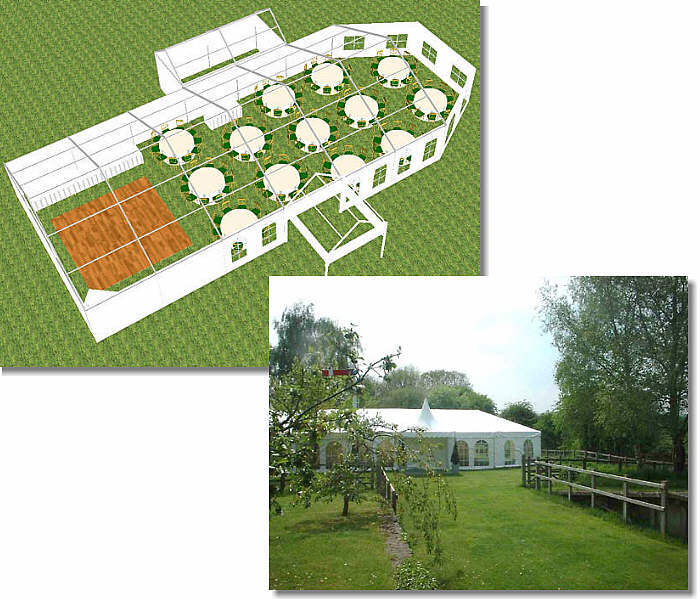 The hire charge for 2006 includes a 21 m x 9 m D-ended marquee to seat up to 130 guests, together with pleated ivory lining, oriental canopy entrance marquee, catering tent, lighting, flooring, dance floor and porta loos. Electricity and water is also provided. At the moment we are not sending out brochures, so please email or telephone Val to arrange a viewing, and she will be delighted to discuss your plans with you. 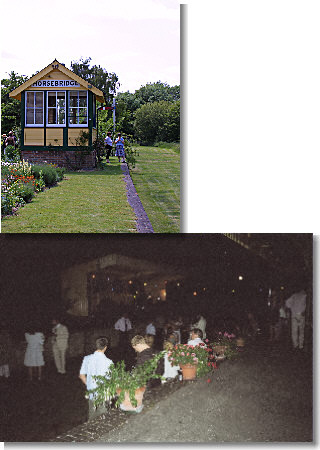 A DVD showing a wedding held here last summer is available, giving a more vivid impression of the station and its gardens at that time of year. 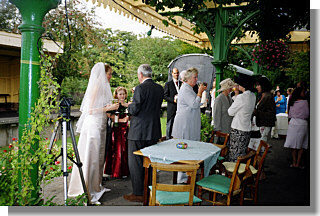 We are unable to hold wedding ceremonies at the station as the rooms in the station house are too small. We regret that, as the law stands, wedding ceremonies have to be held in a building, so until the law is changed to enable us to use the marquee, we can only hold receptions. However, there are two beautiful local churches as well as nearby hotels and Registry Offices where wedding receptions can be held. 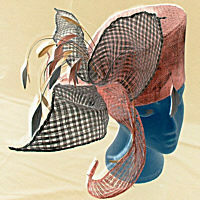 Val, who is a London-trained milliner, can also provide hand made hats to your individual colour and style.